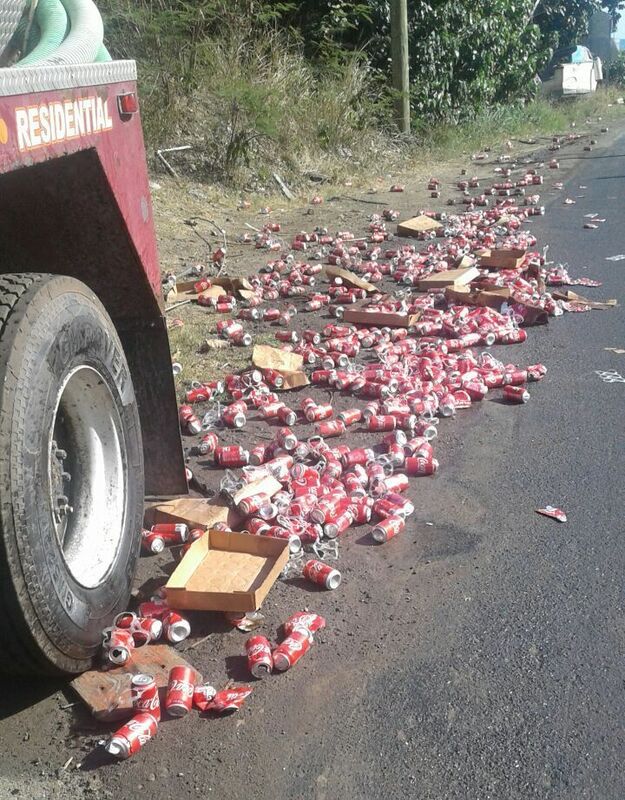 HANNAH BAY, Tortola, VI - Around 3:00 P.M. today Thursday, April 12, 2018, our roving camera observed some coke in cans scattered alongside the roadway in the area of Hannah’s Bay, on the western side of Tortola. The situation seems like they fell off a truck being delivered somewhere, however, how and what happened was not immediately known. 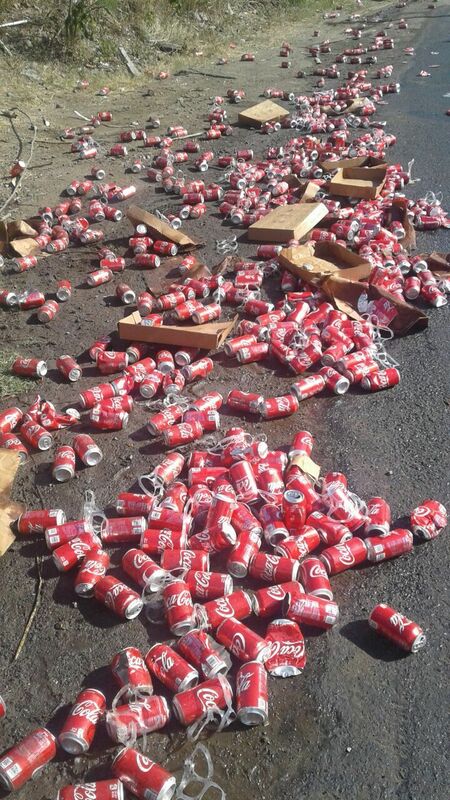 The area where the scattered coke soft drinks, along with some boxes were on the side of the road is also referred to as Sandy Grounds. The unsightly spectacle did not seem to pose an immediate challenge to traffic beside the curious onlookers, that could be distracted. If the vendor is not back to clear up, then it’s our understanding the clean-up efforts will be undertaken by the Department of Waste Management (DWM), a government agency. Let me see what I can grab. One eye, you can care less that someone just lost a huge profit dude have a heart. It happened so people like you can show who you really are. Just like how it’s like after Irma hit us. No one is pretending, everyone actually who they are. @Hmmm, got you. For real. This was just an unfortunate accident, not karma or anything else. Someone lost a big amount of money here, but I am wondering why didn’t they pull over and clean it up. Truth. However. God don't like ugly.. Whether it is good or bad dont wish no one evil as you never know when it is your turn and it may be worse.Even if you keep it in your heart God knows your thought and he doesnt like ugly. I pray that it wont be a deep lost to anyone or business.It doesnt matter how good or bad life for us we always never need no bad to befall us. Yes leave it for the government (tax payer)to clean up after you. Obviously an unsecure load. Driver should be traceable (who is the wholesaler) and fined. Could have fallen on a car and caused an accident. You cant tell me he didnt notice that amount fall off. Saying the white lady coke may have been put into the brown lady coke you may be right.It has been done so much time in pepsi etc.Father in Heaven continue to shine light into the darkness of this world. So these fell off someones truck and they didn't even stop to clean it up? Only in the BVI buddy where u do what u want. Have a Coke and a Smile!!!! Why is the media reporting such things as opposed to posting the picture, taking time to write an article as if to appear bored, why not simply stop and pick them up and discard them if unusable? are we all not in this together to keep the BVI clean in anticipation of rebuilding, repairing and renewing? Gosh man!!! report things worth reporting and help rebuild the islands you live in. This is worth reporting . It is indicative of our lazy care less attitude . Let someone else clean up after me ..let the govt take care of me ..how much can I take with the least amount of effort . No way for the recovery to be successful. . How about taking away this drivers liscense for 6 months ? We have to change the tune people . We were spoken to quite loudly 7 months ago . Did we listen ? That much better than having our kids drink that death juice. A nice ice cold coke with some fresh squeezed lime juice and a plate of hot wings with ranch dressing on the side, Sooo good. Well no news is good news.